IJApps today is pleased to announce the release and immediate availability of GoBlue 1.0 for iPhone and iPod touch. 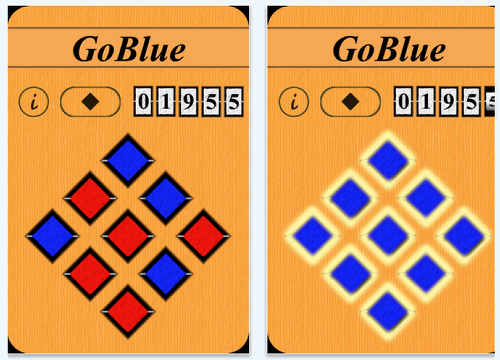 GoBlue is a puzzle game that tests logic and memory skills. It never finishes, players keep playing to build their score. The smarter they play, the faster their score grows. Scores are compared between friends. Mobile Force Corp, an emerging developer of games specifically for mobile platforms, today is pleased to announce the release of Oh! My Gun! 1.0 for iOS, With a focus on puzzle-based action, Oh! My Gun! is a level based third-person shooter in which the player uses guns, bombs, heavy objects, gravity, or any combination of these things together to defeat all enemies on a given stage and advance within the game. Each level offers the player a limited amount of ammunition, forcing them to develop clever strategies in order to banish every demon successfully. Oh! My Gun! is currently available on the iTunes App Store. Oh! My Gun! offers a full featured mobile gaming experience. The app includes over 300 levels of mentally engaging puzzle-based mayhem, Un-lockable in-game achievements, and online player leaderboards. Integrated with Facebook and Twitter, the game also allows users to share scores and information from Oh! My Gun! with friends easily while on the go. With such an array of in-depth features, as well as the ability to create a customizable in-game soundtrack from a users existing mobile music library, together make Oh! My Gun! a complete gaming experience not to be missed! Developed to provide a fast paced gaming experience and boasting enough achievable features and levels to ensure that any engaged player has enough content to be satisfied game after game Oh! My! Gun! is sure to not disappoint. 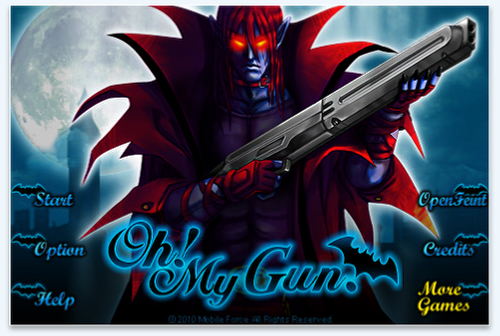 Everyone has problem solving skills, now use them to start a demon slaying, gun-slinging adventure today! Oh! My Gun! 1.0 is only $0.99 USD (or equivalent amount in other currencies) and available worldwide exclusively through the App Store in the Games category. 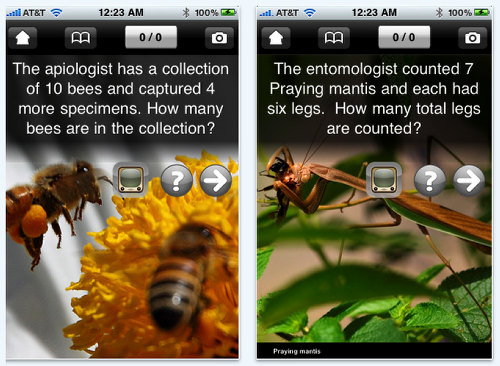 iHomeEducator today is pleased to announce the release of iLiveMath Entomology 4.0, which features ~100 photos, ~40 videos, and ~1 million word problem/answer combinations teaching addition, subtraction, multiplication, division, and basic geometry across three levels of difficulty. Using the Apple iPad Dock Connector to VGA Adapter the teacher can control the app as well as display the word problem and photograph on an external projector. The adapter does not mirror the app display but instead pushes the photo and word problem content to the external screen while the answer and formula is given to the teacher within a pop-up view on the device. At the end of the session the teacher can email the test problems and answers for future classroom grading and record keeping. Test results can also be posted to a public or private blog. The Apple iPad Dock Connector to VGA Adapter is supported by the iPad, iPhone 4, and iPod touch (4th generation). All iLiveMath apps ported to 4.0 will support this new adapter. iLiveMath Entomology 4.0 is offered at the list price of $4.99 USD (or equivalent amount in other currencies) and available worldwide exclusively through the App Store in the Education category. myRMX proudly joins the rock circus that is Shinobi Ninja with the release of an iPhone/iPod touch for the Brooklyn based band. Well known for their high energy shows and the house party vibe to their unique blend of reggae, rock and rap, their fans can now remix two of their songs using myRMX. "Brooklyn to Babylon" and "Rock Hood" are the two tracks for fans to re-imagine and share their remixes with others using the myRMX platform. No strangers to the hard work and hustle needed to make an impression in today’s music industry, Shinobi Ninja has risen fast through the diverse New York music scene to make a mark. Each member brings their unique talents and personality to the musical blend that has enthralled audiences throughout the New York and East Coast music community. Their enthusiasm and musical talents are a natural fit for myRMX, which allows them a new level of engagement with their fans. 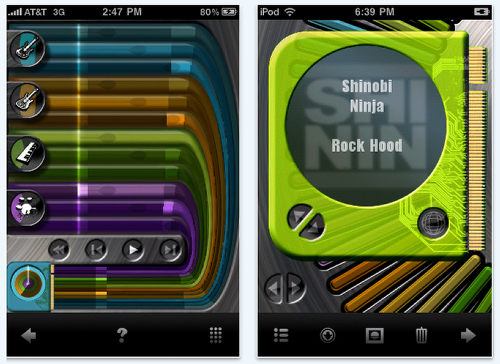 myRmx is excited to bring the headbang house party that is Shinobi Ninja to every iPhone/iPod touch user. Shinobi Ninja joins the diverse group of artists utilizing myRMX to engage their fans by letting them "play" with their music. DJ legend Mix Master Mike, teen pop idol Selena Gomez and The Scene, groundbreaking rockers Breaking Benjamin, indie pysch pop darlings The Asteroids Galaxy Tour and others are all breaking ground in the mobile music space with myRMX. myRMX is a unique iPhone experience that allows anyone to remix their favorite artists’ songs with a fun, game-like interface. Users can save their mixes and share those mixes with friends via email, and by posting myRMX sharecodes on the their social sites. A growing catalog of songs are available through the myRMX In-App Store. * Users can share their saved mixTONEs (active mixes) directly from the App to their contacts via e-mail using our free "ShareCodes"
* Users can e-mail their saved mixTONEs to post on Twitter, Facebook, or any other social site using our free "ShareCodes"
ShiNin:myRMX 1.2×410 is only $2.99 USD (or equivalent amount in other currencies) and available worldwide exclusively through the App Store in the Music category. The University of Tennessee Community Partnership Center (CPC) has led the development of a mobile tourism application to encourage asset-based economic and community development in Knoxville. The CPC partnered with community organizations in Knoxville to create content for a walking tour to promote African-American heritage and cultural tourism in Knoxville. 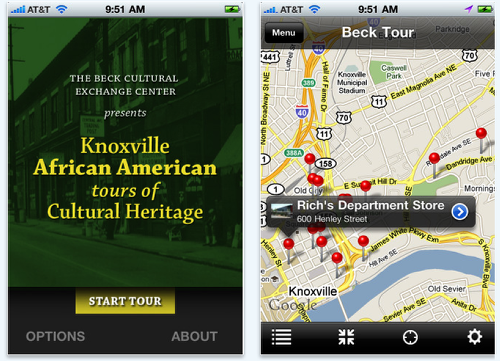 The Beck Tour app is a free iPhone app that presents a walking tour featuring 13 historically and culturally significant sites in and around downtown Knoxville, TN. While at or near each your site, the app enables users to read brief narratives about the site’s importance and view photos of notable people and events related to a particular site. Adding to the uniqueness of this app, tour participants can view 4-6 minute videos about the historic and cultural significance at 10 of the sites. The Beck Cultural Exchange Center, the lead community organization in the project, is a part of the Knox County Library System that researches, collects, preserves, and exhibits African-American achievements and culture. Additionally, the Carpetbag Theatre is a performing arts organization that created the digital stories, 4-5 minute videos that provide virtual interpretation of ten sites on the tour. All the content in the app was created by local historians, artists, designers, and software developers drawing upon the remarkable archives of the Beck Cultural Exchange Center. "With this cultural heritage tour, we hope to create an immersive experience and a new way for people to view historic content and learn about notable people, past uses of particular buildings, or happenings at significant sites while standing at or near the site," said Eric Ogle, the project’s leader at UT. "Whether you are a visitor or a local, we think everyone one interested in Knoxville will want to view the tour." Also integral to the project at UT is Sarah Lowe, Associate Professor of Graphic Design in the School of Art. Sarah was involved with the project from an early stage, and involved one of her classes with the design of the web-based tour interface. However, the graphic design of the app was entirely Sarah, and her expertise in human-computer interfaces brought a lot to the intuitiveness to the app with the goal of providing an enjoyable user experience for first-time users of the app. Providing the programming for the iPhone app was software developer David Levi, who recently started up his own company, Double Apps, Inc. David was drawn into app development primarily through games, and has some gaming apps on the App Store, but the geo-location aspect of this project was of special interest to him. David is an excellent software developer with 20 years of experience, and with the content available for this tour he was able to program a lot of functionality into the app while creating a scalable framework that will enable the Beck Center to add additional tour sites and content to the app for years to come. Beck Tour 1.0 is free and available worldwide exclusively through the App Store in the Travel category. 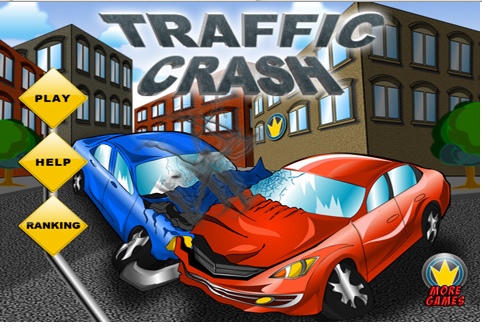 Traffic Crash is the third of MiniJuegos’s games where their own ranking system is inserted. About it the lead programmer, Alberto Cenalmor, said "users love to compete in a ranking system and see their names online so we can expect to see the API evolve to something else, more social". Alberto Cenalmor said "At this moment users get as many free apps/games as they can. To pay for something when the competition has it free it’s no longer an option for us. We will try to add paid content to the games that prove to be succesfull in downloads"
Impresiones Web is a leading spanish internet company. It’s main service is the adnetwork that operates under the Impresiones Web brand. Other services include hosting, CMS, Domain registration and iOS app design and development. Electric Pocket, the company that brought the famous BugMe! app to mobile devices over a decade ago, today announces an easy new way to give yourself a persistent reminder that something needs to be done. The company’s new Nag app for iPhone offers a simple control screen for setting a quick reminder for yourself – tap on the 5 minute button, and Nag will sound its alarm in five minutes, and will continue nagging each minute thereafter until it is silenced. "Just give me 5 more minutes" is often heard throughout homes and offices as people need a bit more time to wrap up what they’re currently doing before jumping onto something new, but too often that "5 more minutes" comes and goes with the person completely forgetting what they were supposed to do. With Nag on their iPhone, they can simply tap on a single button to set a nagging alarm that will jog their memory over and over. 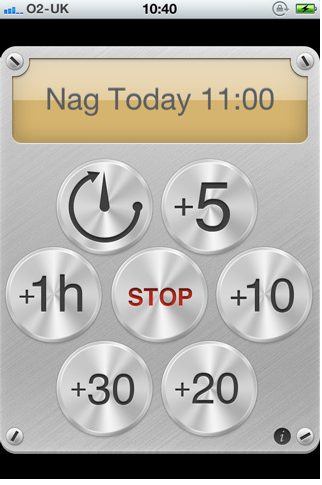 Nag’s novel controls lets users press a single button to set an alarm at the top of the hour, or at a set time – such as in 5 minutes, or an hour from now. To fine-tune the alarm time, they can simply press the time buttons again to add to the elapsed time. When the alarm time comes, Nag will sound its alarm – and will continue its nagging every minute until you acknowledge the alarm. "Nag is the perfect answer to the ‘just 5 more minutes’ or ‘I’ll leave in a hour’ situations we all face – and forget – daily!" says Iain Barclay, Electric Pocket’s chief products officer. "It’s also a great way to remember to plug the parking meter or make sure your meetings don’t overrun." Nag – One Tap Alarm 1.0 is free and available worldwide exclusively through the App Store in the Utilities category. 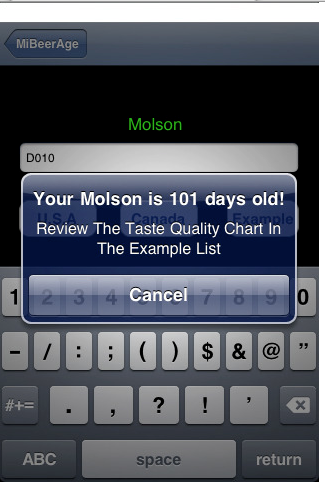 CRIRS REI, LLC today is pleased to announce MiBeerAge 1.1 for iPhone and iPod touch, an update to their app which calculates the age, in days, of any bottle or can of beer. Ideally, beer should be consumed within the first 30 days of bottling. The app allows the user to select the brand of beer, enter the alphanumeric code printed on it, and the app automatically decodes and calculates the exact number of days since the beer was canned or bottled. 24 different brands are included with regular, free updates. It also has a built-in link to the MiBeerAge website so users may contribute additional brands of beer to the app’s growing library. Using the MiBeerAge app is simple, and the GUI is intuitive and easy to operate. On launch, the top half of the screen is taken up by the cylindrical iPhone odometer display listing 24 different brands: Bass, Bud Light, Budweiser, Coors, Coors Light, Corona, Corona Extra, Corona Light, Dos Equis, Foster’s, Guinness Draught, Heineken, Heineken Light, Labatt Blue, Labatt Blue Light, Miller, Miller Genuine Draft, Miller Light, Modelo Especial, Molson, Negra Modelo, Pacifico, St. Pauli Girl, and Tecate. The user rotates the display until their choice shows through the translucent selection window, and then touches the Select Your Beer button beneath. This brings up the input screen, where the user enters the appropriate alphanumeric code located on the can, bottle, or packaging. An Example button is available to give a sample of the coding used for any particular brand. In the case of Miller Light the Example function advises, "On the bottom of the can, neck of the bottle, or the beer packaging there is an expiration, best by, or remove from shelf date. The date example is always a future date. Enter that date e.g., ‘SEP2710’ or ‘OCT1310’ from your bottle, can, or package and we’ll calculate the age from the day it was born, not the expiration date. Enjoy your beer!" Hitting the Enter button after entering the code computes the exact age, in days, of any beer they may be planning to purchase. There are numerous factors which may affect the taste of beer, but among the most important is the freshness. MiBeerAge suggests that beer 0 – 30 days old will taste excellent; 31 – 60 days, very good; 61 – 90 days, good; 91 – 120 days average; 120+ days, poor. Other important factors include: temperature (always buy cold beer), the Pasteurization process employed, the sterile filtration process, the bottle/can conditioning process, and the beer recipe. MiBeerAge 1.1 is $1.99 (USD) and available worldwide exclusively through the App Store in the Lifestyle category. iNtervalSoft today announced EZ-RUN and its trial version, EZ-RUN LT. EZ-RUN revolutionizes the running computer by using the iPhone and iPod touch in a new and exciting way. EZ-RUN uses any ANT+ heart rate monitor belt and ANT+ foot pod to easily and accurately track a runner’s heart rate, speed, and pace. And of course, it is audible, so runners don’t have to look at the screen to know how they are doing. EZ-RUN uses Wahoo Fitness’s Fisica to transform any iPhone or iPod touch into a full-featured running computer. The Fisica is a small accessory that plugs directly into an iPhone or iPod touch and turns the device into a receiver for any ANT+ sensor such as heart rate monitor belts and foot pods. Although many manufacturers make ANT+ sensors, users can buy the necessary heart rate belt and foot pod directly from Wahoo Fitness’s online store. EZ-RUN uses the sensors to record heart rate, running speed, and pace. All three are displayed on EZ-RUN’s easy to read display. But since most runners don’t look at their iPhone while running, the user can set EZ-RUN to audibly inform them of their heart rate, speed, and pace. EZ-RUN can also use GPS if using an iPhone. A user can track GPS or use GPS to determine speed and pace. For accuracy, the foot pod is recommended over GPS determined speed. After their run, a user can review results in EZ-RUN, send the results to FaceBook, or send the results to Training Peaks for further analysis. More upload options will be available in the next version. Rather than tying the user into an online site, with a hefty subscription fee, EZ-RUN lets the user choose what to do with the data. EZ-RUN uses real sensors. No tapping an iPhone’s screen to guesstimate heart rate. No putting a phone in running shorts to guesstimate steps. EZ-RUN relies on industry standard, accurate, ANT+ sensors. EZ-RUN is the new standard in iPhone/iPod touch running apps. There is no risk to try EZ-RUN – a user can try EZ-RUN LT for free. If they like it, they can buy the full version. If they don’t, they can go to Wahoo Sport’s website and find another compatible App to buy on iTunes App Store. And if they don’t like any apps, remember, the user can use the heart rate monitor belt and foot pod with other ANT+ products such as sports watches. HourClash – The new addictive puzzle game! KadaMedia’s latest game,"HourClash – The new addictive puzzle game!" is now available in the app store and can be played on all versions of the Apple iPhone and Apple iPad. HourClash is a challenge for the most avid puzzle gamer. Easy to play, yet tough to master, HourClash features physics based gameplay, great soundtracks and 15 fun levels. 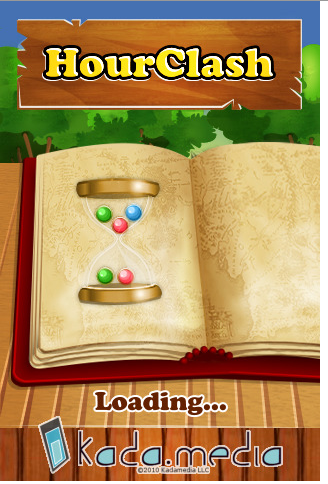 The premise is initially simple … match colored balls as they fall through an hourglass. Once the action begins however, gamers will realize this is a daunting challenge with bombs bursting and colors changing more rapidly as the levels progress. Initial feedback on the game has been extremely positive with users comparing the gameplay to earlier hits like Tetris (EA) and Trism. In a land long ago there lived a beautiful queen and handsome king that ruled a magical land of puzzlana which contained a magical hourglass that brought good fortune to all who lived there. Sadly, one day a evil wizard who was envious of the king and queen and decided to cast a dark spell on the land and its people. The king and queen were imprisoned against their will and the good fortune of the land was stolen by the wizard. HourClash! 1.0 is $0.99 USD (or equivalent amount in other currencies) and available worldwide exclusively through the App Store in the Games category. In the next month, KadaMedia is expected to release an iPad only version of HourClash as well as a HourClash – Halloween Edition version . Follow us on twitter @kadamedia to get the latest updates. Exclusive to Auto Windscreens, the app is designed to help drivers save time and money after getting a chip in their windscreen. 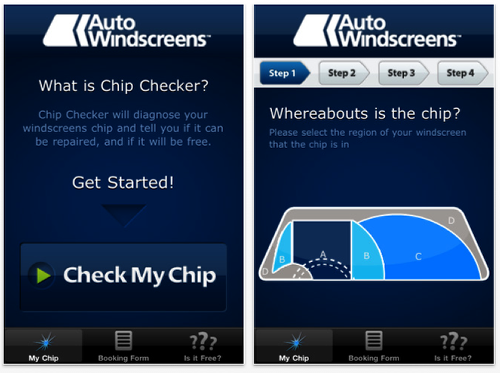 You simply follow four easy steps and the Chip Checker determines if your windscreen damage is repairable. This new app has been developed to work in the same way as the original acetate gauge Auto Windscreen technicians use to measure windscreen damage. Chip checker is a free app, available NOW from the Apple app store. Mehware today is pleased to announce Viking Funeral 1.1 for iOS, an innovative and addictive game challenging those who dare to enter the realm of the fearless Viking. If "Battle" mode isn’t enough to keep you coming back for more, just wait until you enter the tavern for a chance to up your score and gamble your winnings. Worried you are not up for the challenge? Target practice will whip any amateur into shape. Battle Mode – survive as long as you can, you’ll eventually end up in the tavern (they always do). Features a full 3D viking world with stunning particle effects, animation, sound and music. Day and night cycles with difficulty level progression. 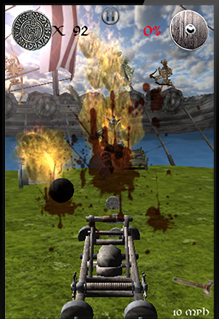 Target Mode – practice and compete here in the timed thirty, sixty, and ninety seconds to hit as many targets and vikings running across the screen as possible. This mode is about quickness, flick those boulders as fast as you can. Versus Mode – play a friend in the viking lava level from hell fully synced over bluetooth/wifi. Targets will pop up and first person to hit the target gets the points. The target will disappear only to come back shortly after. Player with the most points in the timed match wins. Challenge your friends, it is called "Versus" mode for a reason. Viking funeral is the perfect pick up and play game so simple you can battle, hit targets, and play your friends with one hand. Make sure to enable Open Feint to take advantage of the online leaderboards and to unlock achievements. Viking Funeral 1.1 is only $0.99 USD (or equivalent amount in other currencies) and available worldwide exclusively through the App Store in the Games category. Veenix, LLC is pleased to announce Quick-Tunes: One-Click Music with Quick-More and Sleep Timer for iPhone and iPod touch. 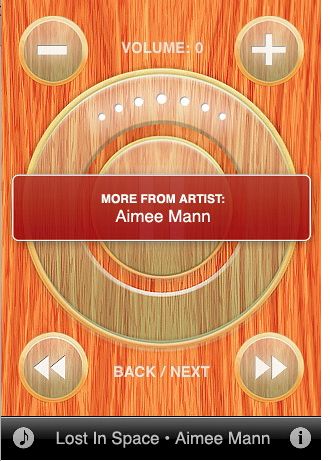 The new iOS 4 app packs a variety of handy music player features into a hip, uncluttered Retina Display interface. Quick-Tunes starts playing music from the user’s music collection on app launch. A large, luminous Quick-More dial offers further quick and easy solutions to hear more from the currently playing artist, album, genre or a random selection of music. Cover art and complete track info can be tap-toggled on-off, and a convenient 30 minute sleep timer allows users to drift off to sleep with their music without fear of waking to a dead battery. Quick-Tunes offers a quick-hip alternative to Apple’s built-in music player, and is especially useful when driving or in other situations where focus needs to be elsewhere. Quick-Tunes 2.0 is only $0.99 USD (or equivalent amount in other currencies) and available worldwide exclusively through the App Store in the Music category. 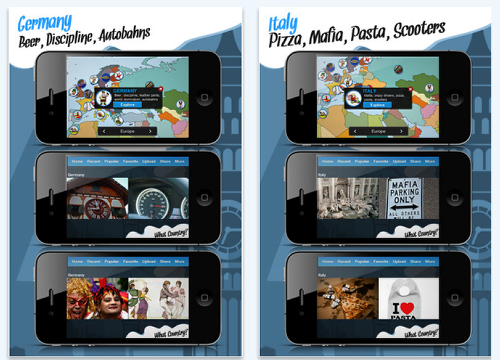 Apalon today is pleased to announce the release of What Country 1.0 for iPhone and iPod touch. What Country is an unusual collection of humorous photos spiced up with curious facts that are able to impress those who love travelling and who do not. What Country is built on Apalon’s app gallery solution, which is used by bestseller iPhone apps such as Dream Home and Eye Illusions. That guarantees users engaging experience and easy navigation through the collection. One of the main features of the app is its interactive component. Users can rate photos they like, add them to Favorites and upload their own pictures complementing them with background information. "Lots of people around the world love travelling and surprisingly even more do not. As a frequent traveler I met many people that heard about 10 or 15 countries at most. We wanted to change that with our What Country app that even non-travelers will want to own. It highlights only 3 or 4 key facts about each country and presents them in entertaining way that will make them laugh or smile." – said Peter Melnikov, VP of Apalon. Pingify Network Inc. today is pleased to announce the release of their Ping Me! app that allows users to "request" only useful and relevant data from Craigslist through the Company’s proprietary software – the Personal Internet Notification Gateway ("PING") and get relevant results in real-time. Ping Me! for Craigslist is a smart notification engine that guarantees users access to the data in a timely and efficient manner. Currently Ping Me!focuses on the world’s largest free bulletin board website, Craigslist and available in Canada and the USA. In the near future more sites will be added to extend the search. Ping Me! is an indispensable tool for those who appreciate having fresh information and want to be notified in real-time when someone posts a new ad that measures up to their requirements without manual searches. Users won’t need to waste their time filtering through useless information. All they need to do is to create requests right from their mobile device and get access to the classifieds they have a direct interest in. "We are very excited about introducing our application to North America. We believe that we have created a new way of getting information from the Internet. People are feeling the pressure of staying on top of so many different sources of information from social apps to RSS feeds to finding the right apartment to live in using Craigslist. Keeping everything relevant is a full time job. Ping Me! takes away that pressure and gives back some of that lost time." – said Jason Gray, Co-Founder of the company. Ping Me! 1.1.4 is $0.99 USD (or equivalent amount in other currencies) and available worldwide exclusively through the App Store in the Utilities category. Fractals are complex geometric forms that display detailed structure over a range of different scales. Despite their complexity all the fractals in Chromatic Chaos are generated by very simple mathematics. Chaos theory – characterized by the famous "butterfly effect" – relates to systems where small changes in input cause dramatic changes in output. In Chromatic Chaos the consequences are the intricate and often beautiful structure of the fractals. Some fractals such as the Mandelbrot initially look like inkblots, but zoom in on the delicate structure around the edges and chaos comes into play. Chromatic Chaos enables zooming to magnifications of several thousand billion. At these magnifications the size of the initial Mandelbrot "inkblot" is comparable to that of Jupiter’s orbit around the Sun. Linda Saul, the app’s developer, says "although fun, this app was difficult to write, it was too easy to get distracted exploring some amazing new fractal". 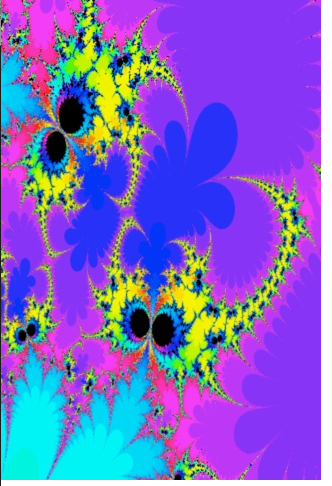 Chromatic Chaos enables fractals to be saved in the built-in "gallery" to return to later, or images can be saved in the photo album. The app is distributed with initial gallery entries giving examples that can be used as the basis for further exploration. The app provides low and high resolution settings. On the iPhone 4 or the new iPod touch the high resolution setting makes full use of the Retina(TM) display. 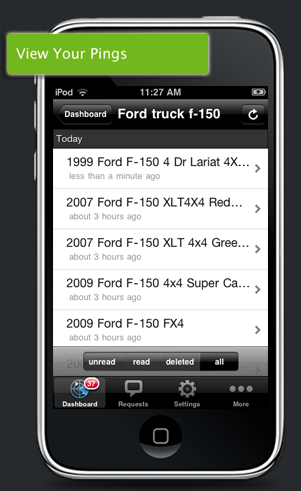 The app supports iPhones and iPod touches running IOS 3.0 or later. Chromatic Chaos 1.0 is $0.99 USD (or equivalent amount in other currencies) and available worldwide exclusively through the App Store in the Entertainment category. Announcing that Kengin Consulting Inc., a mobile development consulting firm, has launched a new application for iPhone, iPad, and iPod touch users called NewfoundlandFUN. This application is available for consumers in two versions, a Lite version and a Deluxe version. The Lite version offers users a sampling of what the Deluxe versions contains, giving users the option to upgrade to the Deluxe version at anytime for significantly more content, photos, and more. 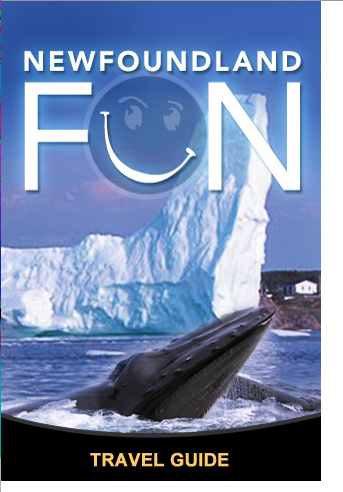 NewfoundlandFUN provides visitors to Newfoundland, or people simply looking to learn more about it’s unique culture, a glimpse into life on the island. The developers have included some fun elements as well, such as a section on local lingo and sayings. This application is available in the iTunes store and is the second installment in the FUN travel series that Kengin has developed. The first installment was AmsterdamFUN, which is also available in the iTunes store. Kengin CEO, Jacob Kennedy, was prompted to develop NewfoundlandFUN after his last visit to the island, "Newfoundland is Canada’s hidden gem! We love the island and wanted to develop an app that would help promote and celebrate Newfoundland’s unique culture. So, we decided that Newfoundland would be the second installment in our travel "FUN" series."